At first glance this season, it looked liked a horrible trade for the Arizona club, parting with Justin Upton and Chris Johnson, for the veteran’s services plus Randall Delgado. 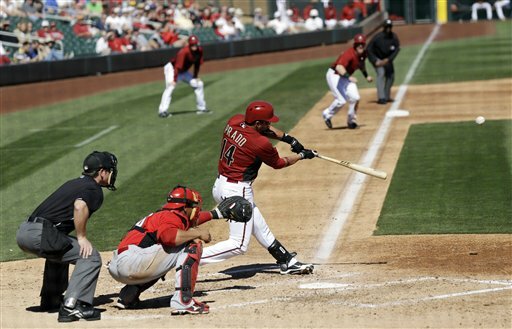 But Since the ALL – Star Break, Prado has a 3 Slash Line of .322/.368/.851 with 40 RBI in just 52 Games Played. He has upped his overall Slash to .279/.327/.737, with 13 HRs and 74 RBI. The 29 Year Old has these stats despite being in a 6 – 37 Slump (.162 BA) over the last 10 Games. The team signed Prado to a 4 Year $40 MIL deal (2013 – 2016) before start of play this campaign. The Team looks brilliant for extending Goldschmidt from 2014 – 2018, to the tune of 5 YRS/$32.05 MIL right now. He may wind up the NL MVP, leading the league in HRs (33), RBI (116), OPS (.952) and TB (302). 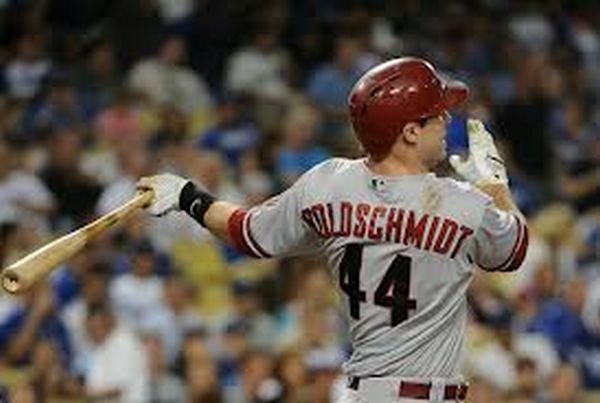 Goldschmidt has hit for an OPS of 1.152 with Runners In Scoring Position this season. The man has remarkable consistency no matter what inning it is in, as he has 11 HRs Innings 1 -3, 10 HRs Innings 4 – 6, and 11 HRs from the 7th Inning on. 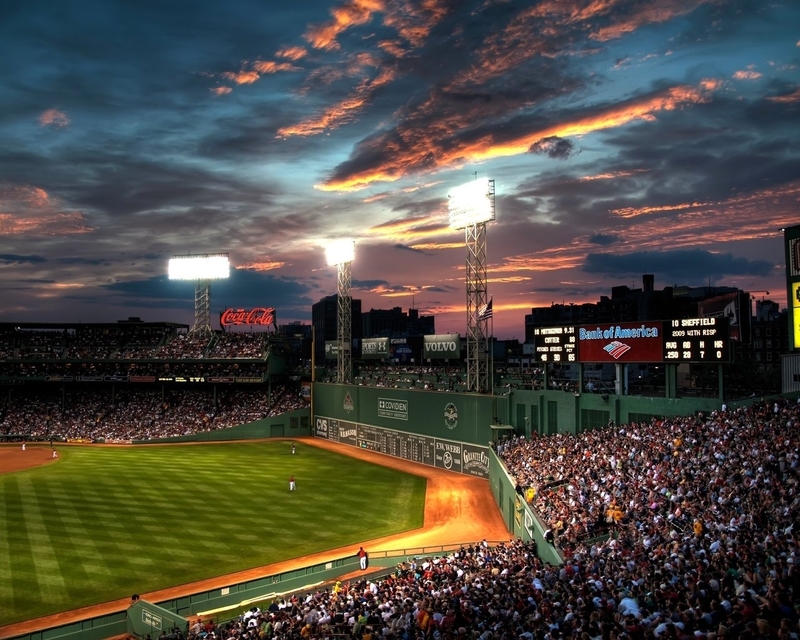 (Including 6 HRs of the 9th Inning or later variety). He should be the face of the franchise for years to come. It is only because the D-Backs are not making the playoffs that the 2013 NL MVP is even in question. Posted on September 17, 2013, in MLB Payroll and Contracts, MLB Teams: Articles and Analysis, On the Verge: MLB Prospects, Players: Fantasy Baseball Articles, The Rest: Everything Baseball and tagged 1b, 1b Daniel Schlereth, 1b/3b 2011 Baseball America's Top Ten Prospects, 2013 Baseball America's Top Ten Prospects, 2013 NL MVP, 3b A.J. Pollock, 3b Chris Owings, 3b Didi Gregorius, 3b Wade Miley, 3b/1b A.J. Pollock, a.j. pollock, Aaron Blair, aaron hill, Adam Eaton, alan trammell, Alex Glenn, Alfredo Marte, Andrew Barbosa, Andrew Chafin, Andrew Velazquez, Andy Green, Anthony Meo, Archie Bradley, Arizona Diamondbacks Management, Arizona Diamondbacks PITCHERS, Arizona Diamondbacks POSITION PLAYERS, Audo Vicente, Austin Platt, Ben Eckels, Bill Plummer Gil Heredia Bobby Smith Visalia Rawhide PITCHERS, Bill Shanahan, Blake Cooper, Blake Forslund, Blake Perry, Blayne Weller, Bo Schultz, Brad Allen, Brad Snyder, brad ziegler, braden shipley, Bradin Hagens, brandon drury, brandon mccarthy, Brandon Sinnery, Breland Almadova, brett butler, brett lorin, Brian Billigen, Bryan Woodall, c Andrew Chafin, Carter Bell, Cesar Carrasco, Charles Brewer, charles nagy, Chase Anderson, chase field, Chase Stevens, Chaz Roe, chris johnson, Chris Owings, Christopher Capper, Chuck Booth. fastest 30 ballgames, cliff pennington, cody ross, Cody Wheeler, Conrad Flynn, Dan Carlson, Daniel Gibson, daniel hudson, Daniel Palka, Daniel Watts, david hernandez, David Holmberg, David Nick, David Peralta, Denver Chavez, Derek Eitel, derrick hall, didi gregorius, don baylor, Doug Drabek, Dustin Martin, Ed Easley, Eddie McKiernan, Elvin Soto, Ender Inciarte, Enrique Burgos, eric chavez, Eric Smith, Eury De La Rosa, Evan Marshall, Evan Marzilli, Fidel Pena, Frank Santana, Garrett Weber, Geordy Parra, George Roberts, gerardo parra, Gerson Montilla, Glenn Sherlock, Greg Gross, heath bell, Henry Garcia, Hillsboro Hops (NW), Hillsboro Hops PITCHERS, Hillsboro Hops POSITION PLAYERS, j.j. putz, j.r. bradley, J.R. House, Jacob Cruz, Jake Barrett, jake fox, Jake Lamb, jarrod parker, Jason Camilli, Jesse Darrah, Jimmie Sherfy, Joash Brodin, Joe Kernan, joe paterson, joe thatcher, John Hilliard, John Leonard, John Pedrotty, Johnny Shuttlesworth, Jonathan Griffin, Jordan Parr, Jose Jose, Jose Martinez, josh collmenter, Josh Parr, Josh Wilson, juan rivera, Justin Greene, justin upton, Justin Williams, K.L. Wombacher, Kaleb Fleck, Keith Hessler, Keon Broxton, Kevin Medrano, Kevin Munson, kevin towers, kirk gibson, Kyle Schepel, Kyle Winkler, lhp A.J. Pollock, lhp Archie Bradley, lhp Bobby Borchering, lhp Chris Owings, lhp Chris Owings Mike Belfiore, lhp Keon Broxton, lhp Marc Krauss, lhp Matt Davidson, lhp Patrick Corbin, Lynn Kachmarik, Mark Haley, Mark Serrano, martin prado, Matt Gorgen, Matt Helm, matt reynolds, matt williams, Matt Wright, Matthew Davidson, Michael Bolsinger, Michael Brenly, Michael Freeman, Michael Lang, Michael Perez, miguel montero, mike jacobs, Mike McMurray, Mike Parrott, Mobile BayBears (SOU), Mobile BayBears PITCHERS, Mobile BayBears POSITION PLAYERS, Nathan Adcock, nick ahmed, Nick Evans, of 2010 Baseball America's Top Ten Prospects, of 2012 Baseball America's Top Ten Prospects, of A.J. Pollock, of Bobby Borchering, of Brandon Allen, of David Holmberg, of Matt Davidson, of Ryan Wheeler, Patrick Corbin, Patrick Schuster, Patrick Smith, paul goldschmidt, Pedro Ruiz, randall delgado, Randy McCurry, Raul Navarro, Ray Hernandez, Raywilly Gomez, Reno Aces (PCL), Reno Aces PITCHERS, Reno Aces POSITION PLAYERS, rhp Adam Eaton, rhp Archie Bradley, rhp Bobby Borchering, rhp Tyler Skaggs, Rick Parr, RJ Hively, Robert Coe, Roidany Aguila, Ronnie Freeman, Ross Gerdeman, Rossmel Perez, Rudy Flores, Ryan Court, Ryan Doran, Ryan Gebhardt, Ryan Kinsella, Ryan Stovall, Sawyer Carroll, Sean Jamieson, Seth Simmons, shawn camp, Socrates Brito, South Bend Silver Hawks (MID), South Bend Silver Hawks PITCHERS, South Bend Silver Hawks POSITION PLAYERS, ss David Holmberg, ss Marc Krauss, ss Stryker Trahan, ss Wade Miley, Steve Garrison, steve sax, Steven Rodriguez, Stuart Katzoff, Taylor Harbin, Taylor Ratliff, Thomas Brendel, Tom Belza, Tom Seidler, tony campana, Tony Sipp, trevor bauer, trevor cahill, Tuffy Gosewisch, tyler bortnick, Tyler Green, Tyler Linton, tyler skaggs, Visalia Rawhide (CAL), Visalia Rawhide POSITION PLAYERS, wade miley, Wellington Cepeda, wil nieves, Will Harris, Will Locante, willie bloomquist, Willy Paredes, Yogey Perez-Ramos, Yoimer Camacho, Yosbel Gutierrez, Zach Esquerra, zeke spruill. Bookmark the permalink. Leave a comment.